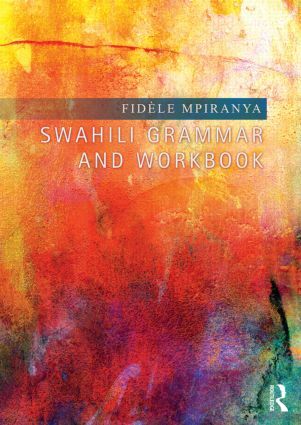 Swahili Grammar and Workbook provides a practical and comprehensive companion to Swahili grammar, filling in gaps left by other textbooks. Presenting the essentials of Swahili grammar in a highly accessible fashion, it reduces complex language topics to helpful rules and mnemonic aids, enabling maximum grammar retention and accurate usage. Grammar points are followed by multiple examples and exercises, allowing students to consolidate and practice their learning. No prior knowledge of linguistic terminology is required. Four appendices, Swahili-English and English-Swahili vocabulary lists, a bibliography and an index presented at the back of the book for easy access to information. Written by a highly experienced instructor, Swahili Grammar and Workbook will be an essential resource for all students and teachers of Swahili. It is suitable for use both as a companion reference text in language courses and as a standalone text in independent grammar classes. Fidèle Mpiranya is Lecturer in Swahili and African Linguistics at the University of Chicago, USA.